Few professions work with more paperwork than solicitors. 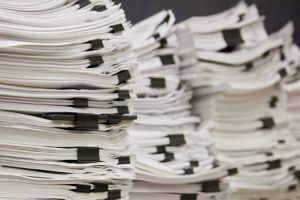 Our Legal clients come to us needing a reliable and secure legal document scanning service to create a paper efficient office. For twenty years, we have helped practices digitise their documents and closed files. We have scanned millions of documents whilst keeping up to date with the latest scanning technologies. Practice’s use our scanning services because we provide secure and cost-efficient solutions. We can scan of everything from contracts to architectural plans, and other unique materials case files might contain. By enlisting the help of PDM, you can focus your time and attention on your clients while we focus on creating electronic documents. By digitising your legal documents, your office scanning can benefit in many ways. The most obvious benefit is that you will be able to eliminate filing cabinets and free office space. PDM will make it easier for you to find the information you need as electronic documents can be tagged, labelled and formatted to be highly searchable. Use PDM to transform your office. Document management services for accountancy firms Scanning and archiving service.